JOLLY, round, red Mr. Sun was just going to bed behind the Purple Hills and the Black Shadows had begun to creep all through the Green Forest and out across the Green Meadows. It was the hour of the day Peter Rabbit loves best. He sat on the edge of the Green Forest watching for the first little star to twinkle high up in the sky. Peter felt at peace with all the Great World, for it was the hour of peace, the hour of rest for those who had been busy all through the shining day. Most of Peter's feathered friends had settled themselves for the coming night, the worries and cares of the day over and forgotten. All the Great World seemed hushed. In the distance Sweetvoice the Vesper Sparrow was pouring out his evening song, for it was the hour when he dearly loves to sing. Far back in the Green Forest Whip-poor-will was calling as if his very life depended on the number of times he could say, "Whip poor Will," without taking a breath. From overhead came now and then the sharp, rather harsh cry of Boomer the Nighthawk, as he hunted his supper in the air. For a time it seemed as if these were the only feathered friends still awake, and Peter couldn't help thinking that those who went so early to bed missed the most beautiful hour of the whole day. Then, from a tree just back of him, there poured forth a song so clear, so sweet, so wonderfully suited to that peaceful hour, that Peter held his breath until it was finished. He knew that singer and loved him. It was Melody the Wood Thrush. When the song ended Peter hopped over to the tree from which it had come. It was still light enough for him to see the sweet singer. He sat on a branch near the top, his head thrown back and his soft, full throat throbbing with the flute-like notes he was pouring forth. He was a little smaller than Welcome Robin. His coat was a beautiful reddish-brown, not quite so bright as that of Brownie the Thrasher. Beneath he was white with large, black spots thickly dotting his breast and sides. He was singing as if he were trying to put into those beautiful notes all the joy of life. Listening to it Peter felt steal over him a wonderful feeling of peace and pure happiness. Not for the world would he have interrupted it. His sides are spotted like his breast. You can tell him by the way he repeats his own name. The Black Shadows crept far across the Green Meadows and it became so dusky in the Green Forest that Peter could barely make out the sweet singer above his head. Still Melody sang on and the hush of eventide grew deeper, as if all the Great World were holding its breath to listen. It was not until several little stars had begun to twinkle high up in the sky that Melody stopped singing and sought the safety of his hidden perch for the night. Peter felt sure that somewhere near was a nest and that one thing which had made that song so beautiful was the love Melody lad been trying to express to the little mate sitting on the eggs that nest must contain. "I'll just run over here early in the morning," thought Peter. Now Peter is a great hand to stay out all night, and that is just what he did that night. Just before it was time for jolly, round, red Mr. Sun to kick off his rosy blankets and begin his daily climb up in the blue, blue sky, Peter started for home in the dear Old Briar-patch. Everywhere in the Green Forest, in the Old Orchard, on the Green Meadows, his feathered friends were awakening. He had quite forgotten his intention to visit Melody and was reminded of it only when again he heard those beautiful flute-like notes. At once he scampered over to where he had spent such a peaceful hour the evening before. Melody saw him at once and dropped down on the ground for a little gossip while he scratched among the leaves in search of his breakfast. "I just love to hear you sing, Melody," cried Peter rather breathlessly. "I don't know of any other song that makes me feel quite as yours does, so sort of perfectly contented and free of care and worry." "Thank you," replied Melody. "I'm glad you like to hear me sing for there is nothing I like to do better. It is the one way in which I can express my feelings. I love all the Great World and I just have to tell it so. I do not mean to boast when I say that all the Thrush family have good voices." "But you have the best of all," cried Peter. Melody shook his brown head. "I wouldn't say that," said he modestly. "I think the song of my cousin Hermit, is even more beautiful than mine. And then there is my other cousin, Veery. His song is wonderful, I think." But just then Peter's curiosity was greater than his interest in songs. "Have you built your nest yet?" he asked. Melody nodded. "It is in a little tree not far from here," said he, "and Mrs. Wood Thrush is sitting on five eggs this blessed minute. Isn't that perfectly lovely?" It was Peter's turn to nod. "What is your nest built of?" he inquired. "Rootlets and tiny twigs and weed stalks and leaves and mud," replied Melody. "Mud!" exclaimed Peter. "Why, that's what Welcome Robin uses in his nest." "Well, Welcome Robin is my own cousin, so I don't know as there's anything so surprising in that," retorted Melody. "Oh," said Peter. "I had forgotten that he is a member of the Thrush family." "Well, he is, even if he is dressed quite differently from the rest of us," replied Melody. "You mentioned your cousin, Hermit. I don't believe I know him," said Peter. "Then it's high time you got acquainted with him," replied Melody promptly. "He is rather fond of being by himself and that is why he is called the Hermit Thrush. He is smaller than I and his coat is not such a bright brown. His tail is brighter than his coat. He has a waistcoat spotted very much like mine. Some folks consider him the most beautiful singer of the Thrush family. I'm glad you like my song, but you must hear Hermit sing. I really think there is no song so beautiful in all the Green Forest." "Does he build a nest like yours?" asked Peter. "No," replied Melody. "He builds his nest on the ground, and he doesn't use any mud. Now if you'll excuse me, Peter, I must get my breakfast and give Mrs. Wood Thrush a chance to get hers." So Peter continued on his way to the dear Old Briar-patch and there he spent the day. As evening approached he decided to go back to hear Melody sing again. Just as he drew near the Green Forest he heard from the direction of the Laughing Brook a song that caused him to change his mind and sent him hurrying in that direction. 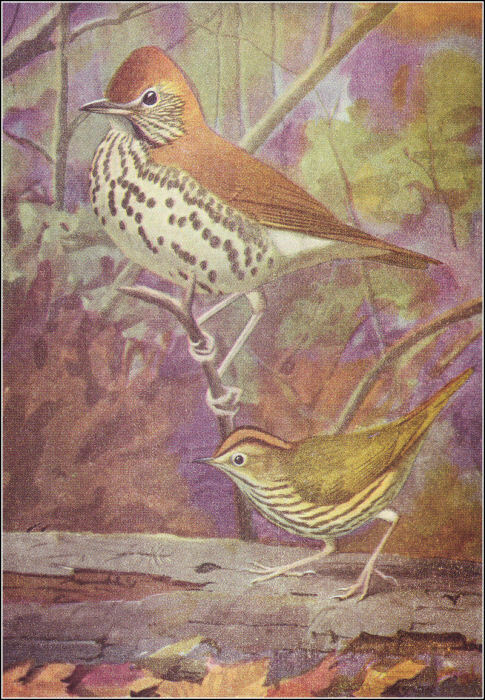 It was a very different song from that of Melody the Wood Thrush, yet, if he had never heard it before, Peter would have known that such a song could come from no throat except that of a member of the Thrush family. As he drew near the Laughing Brook the beautiful notes seemed to ring through the Green Forest like a bell. As Melody's song had filled Peter with a feeling of peace, so this song stirred in him a feeling of the wonderful mystery of life. There was in it the very spirit of the Green Forest. It didn't take Peter long to find the singer. It was Veery, who has been named Wilson's Thrush; and by some folks is known as the Tawny Thrush. At the sound of the patter of Peter's feet the song stopped abruptly and he was greeted with a whistled "Wheeu! wheeu!" Then, seeing that it was no one of whom he need be afraid, Veery came out from under some ferns to greet Peter. He was smaller than Melody the Wood Thrush, being about one-fourth smaller than Welcome Robin. He wore a brown coat but it was not as bright as that of his cousin, Melody. His breast was somewhat faintly spotted with brown, and below he was white. His sides were grayish-white and not spotted like the sides of Melody. "I heard you singing and I just had to come over to see you," cried Peter. "I hope you like my song," said Veery. "I love to sing just at this hour and I love to think that other people like to hear me." "They do," declared Peter most emphatically. "I can't imagine how anybody could fail to like to hear you. I came 'way over here just to sit a while and listen. Won't you sing some more for me, Veery?" "I certainly will, Peter," replied Veery. "I wouldn't feel that I was going to bed right if I didn't sing until dark. There is no part of the day I love better than the evening, and the only way I can express my happiness and my love of the Green Forest and the joy of just being back here at home is by singing." Veery slipped out of sight, and almost at once his bell-like notes began to ring through the Green Forest. Peter sat right where he was, content to just listen and feel within himself the joy of being alive and happy in the beautiful spring season which Veery was expressing so wonderfully. The B1ack Shadows grew blacker. One by one the little stars came out and twinkled down through the tree tops. Finally from deep in the Green Forest sounded the hunting call of Hooty the Owl. Veery's song stopped. "Good night, Peter," he called softly. "Good night, Veery," replied Peter and hopped back towards the Green Meadows for a feast of sweet clover.